To fit an effect to a Solar projector you need a suitable rotator. Each type of effect (e.g. 6" Wheels, 9" MAX Wheels or 50mm Cassettes) requires a specific type of rotator. If you're using 6" Wheels you need either a Fixed Speed Wheel Rotator or a Variable Speed/Direction Wheel Rotator. For the large format 'MAX' Wheels you'll need a Dual Wheel Rotator - this rotator also accepts both normal 6" Wheels and 9" MAX Wheels. 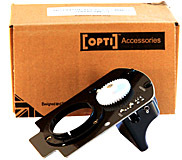 Please note that the OPTI Aura projector has a wheel rotator built-in and other rotator types cannot be fitted to the Aura projector.